In Australian media news this week, the latest EMMA data shows mobile newspaper readership is up 14% year-on-year, Real Estate websites reach all-time audience highs, Val Morgan research shows cinema boosts positive brand sentiment by 42%, The Newspaper Works launches its largest-ever newspaper campaign, and Mi9 launches three new Ninemsn Lifestyle websites: Honey, Coach and Pickle. 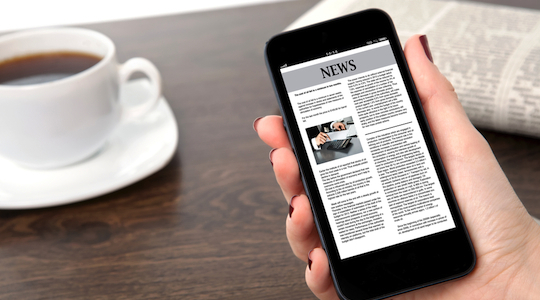 Newspaper readership on mobile has increased 14% year-on-year to 3 million users per month, making it the fastest-growing platform, according to the latest data from EMMA (Enhanced Media Metrics Australia). The data, for the 12 months to February 2015, shows tablet audiences have increased 9% to 3.1 million readers, while print readership has declined by 2% to 14.2 million readers. Total newspaper readership rose by 2% to 16 million. “More than three quarters of our population now own a smartphone, which has doubled in the last four years, according to the Telstra Smartphone and Tablet Index. Real estate websites realestate.com.au and Domain have both recorded all-time highs for unique audience, according to Nielsen Online Ratings March 2015. Realestate.com.au’s unique audience figure for March reached more than 4 million for the first time, a 15% increase from February and an increase of 656,000 compared to March 2014. Domain’s unique audience in March was 2,460,000, a 38% increase on its February figure and an increase of 966,000 compared to March 2014. OnTheHouse.com.au also increased, 58% from 528,000 to 832,000. Adding cinema to the marketing mix delivers a 42% uplift in positive brand sentiment, according to Val Morgan’s Power of Cinema research series findings. The results form part of an extensive, first-of-its-kind study with Brandscience, into cinema’s role in screen strategy alongside complementary media channels. The study has also shown cinema improves brand consideration by 40%, increases top-of-mind awareness by 156% and increases main message cut-through by 66%. Brandscience interviewed 1200 people across metro Australia. Australia’s four largest newspaper publishers have launched their largest ever marketing campaign, ‘Influential by nature’ with industry body The Newspaper Works. The print and digital campaign, created by The Hallway for APN News & Media, Fairfax Media, News Corp Australia and West Australian Newspapers (Seven West Media), demonstrates real examples showing how newspaper campaigns have helped advertisers and the community. 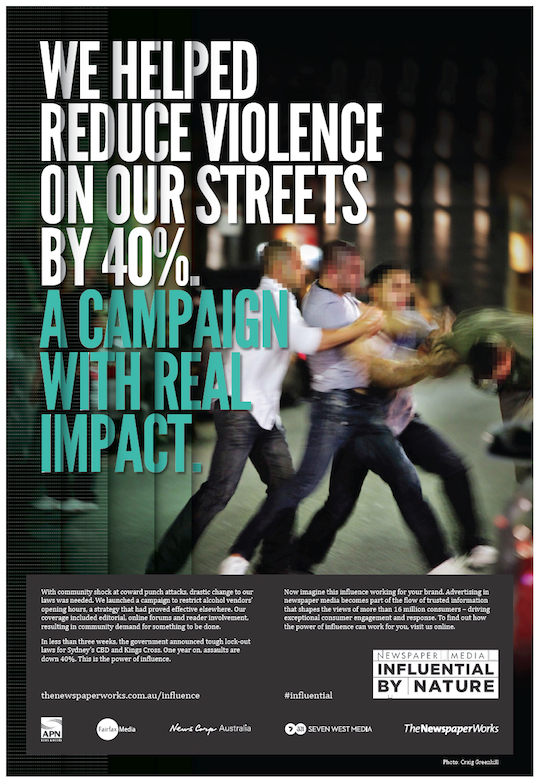 The first execution shows how a compelling and consistent newspaper media campaign aimed at reducing the incidence of alcohol-fuelled violence on Sydney’s streets resulted in a 40% reduction in violent assaults. Honey: is a boutique digital style destination for women focusing on fashion and beauty, publishing style how-tos and advice. It will also soon offer shopping functionality. Honey will be the official digital media partner of IMG’s Mercedez-Benz Fashion Week. Pickle: is a viral news site that covers trending topics on social media and offbeat original features. Mi9 says, “Unlike other aggregation sites, Ninemsn Pickle mixes quirky viral content with stories that have meat on their bones”.